Dream Warriors Nightmare On Elm T-Shirt - This Nightmare on Elm Street tee shirt features the the third installment from the original Nightmare on Elm Street horror movie series, Dream Warriors. 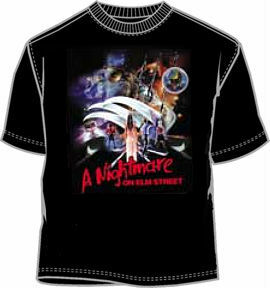 Our Nightmare On Elm Street tee shirt makes a great gift for horror movie fan! This horror movie shirt color is as shown and these tees are made of preshrunk cotton. If you have questions regarding our Dream Warriors Nightmare on Elm Street t-shirt or any of our other Nightmare On Elm Street tee shirts or merchandise, please email us with the product name and number.